Heat oven to 350ºF (325ºF for dark or nonstick pans). Place miniature paper baking cups in 24 mini muffin cups. Make cake batter as directed on box. Fill cups 2/3 full of batter (about 1 rounded tablespoon each). Refrigerate remaining batter. To make tassels: Cut sixty 2 1/2-inch lengths from fruit snack rolls. Cut each into several strips up to 1/2 inch from 1 end. Roll uncut end between fingertips to make tassels. Or cut several pieces of shoestring licorice into 2 1/2-inch lengths. Tint frosting with food colour to match paper baking cups. Frost bottoms of cookies. Place 1 candy on centre of each. 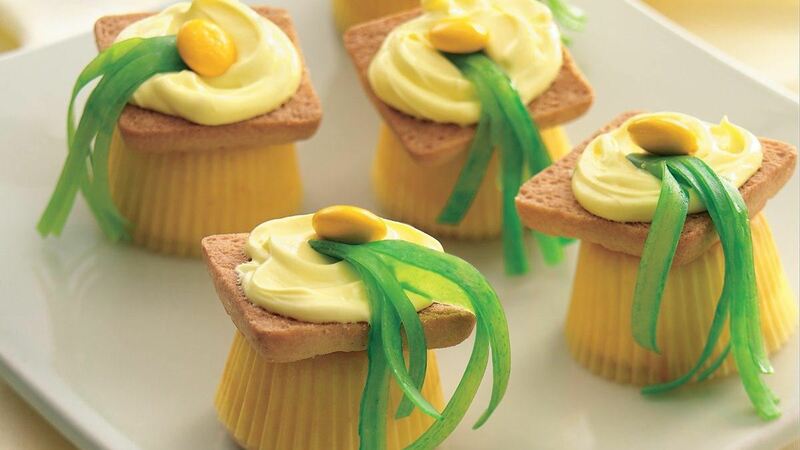 For each mortarboard, place small dollop of frosting on bottom of cupcake; top with cookie. Press uncut end of fruit snack or 3 or 4 pieces of licorice into frosted cookie next to candy. Store loosely covered. Special Touch : Share this dessert with family and friends of your graduate using paper baking cups that match school or class colours.